Exercise balls are a tried-and-true option for exercising small pocket pets like hamsters, gerbils, rats, and mice. All small pets should have a wheel in their cage, but a ball offers another enrichment option. A regular ball works just fine, giving your pet a safe way to navigate around your house without getting lost or injured by other pets. But if you'd like to have some fun with your small rodent's exercise routine, many different options are available. Your hamster, gerbil, rat, or mouse can move around in style and even navigate a track, depending on what you choose. Some balls are even useable in the cage. However, note that a guinea pig should never have a wheel or exercise ball. You can get a plain, clear plastic exercise ball for your pocket pet, but there are several fancier options, like colored balls and even glittery models. 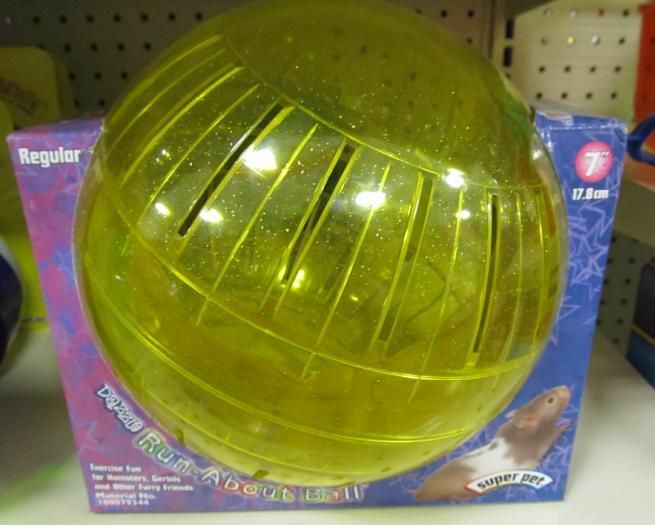 The Dazzle Run-About Exercise Ball adds some glitz to your hamster, gerbil, mouse, or rat's workout. Choose your favorite color and let your pocket pet have the run of the house (or at least a room), in this secure, hard plastic exerciser. Like most exercise balls, the Dazzle Ball is sturdy and easy to clean. The added color makes it easier to keep an eye on and to find so your little pet doesn't disappear. The Dazzle Run-About Exercise Ball, like any standard ball, also serves as a safe holding spot for your pocket pet. Place your furry critter in the ball while cleaning out its cage. Even a pocket pet can be a diva. If your hamster, gerbil, mouse, or rat is a little furry princess, let the royal critter travel in style while getting exercise in the Dazzle Critter Carriage. In the classic kids' tale Cinderella, white mice were turned into horses to pull her pumpkin coach. In this real-life version, your furry little friends can retain their original form and power their own coach, with no horsepower needed. The Dazzle Critter Carriage is harder to move than a regular exercise ball, so it's most suitable for larger rodents. It only moves backward and forward, not diagonally, because of its design. The large, colorful design of the carriage makes it easy to spot so you don't lose track of your pet. Fancy pocket pet exercise balls aren't just for girls. Little boys who own hamsters, gerbils, rats, and mice can give their pets a physical workout in the Critter Cruiser. This version of a standard exercise ball comes in the shape of a race car. The rodent powers the vehicle by running along in the ball. The Critter Cruiser works just like a regular exercise ball, but its appeal is in the "cuteness" factor. Who can't resist an adorable little rodent race car driver? This type of exercise ball is limited to backward and forward movement only, and it can be heavy for smaller pocket pets. Because of its size and design, it's easy to spot so your pocket pet won't get lost in your house if you lose sight for a minute. The Hamtrac is an accessory that goes with standard pocket pet exercise balls or the Critter Cruiser. It's a race track set-up that holds the exerciser so your hamster, gerbil, rat, or mouse can manipulate its exercise ball around the track. The Hamtrac is perfect for homes with limited space, as it keeps the ball from bumping into walls and other objects by containing it to a small, safe area. It also prevents loss of your pet. Putting the Hamtrac together can be a bit of a challenge. Check it over before each use because the track parts may separate. You can snap them back together easily when that happens. Your hamster, gerbil, mouse, or rat is limited to going backward or forward when confined to the Hamtrac. The Van Ness Exercise Ball comes with a stand that makes it into a hybrid between an exercise ball and wheel. The stand elevates the ball so your hamster, gerbil, mouse or rat can run as much as it wishes while staying safely in place. If you'd like to give your pocket pet some freedom, simply remove the ball from its stand and let it move freely on the floor. It's a small alternative to pocket pet play pens. This exercise ball is durable, but some larger pocket pets may damage it by gnawing if you leave it in their cages. How Do You Find a Lost Hamster?